This a short walk designed with the whole family in mind. The path is of even surfacing with a slight incline with a few steps thrown in. It's great opportunity to see these threatened plants. Drive to Lake Tikitapu/Blue Lake, situated 9 km south-east of Rotorua, via Te Ngae Road then Tarawera Road. Once at Lake Tikitapu take the left turn onto Okareka Loop Rd, 1.6km down this is the mistletoe walk on the left. 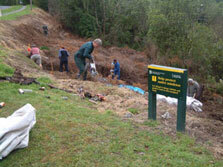 The Ōkareka Mistletoe Walk was built as a joint venture between the Rotorua branches of the Botanical Society and Royal Forest and Bird Protection Society, with support coming from the Department of Conservation and Environment Bay of Plenty. Members of both organisations have formed the Ōkareka Mistletoe Project and regularly hold working bees where they go about controlling weeds and pest such as possums and rats by laying poison baits. These are all threats to the mistletoe plants. Mistletoes are semi parasitic plants which grow on the stems of certain trees and shrubs, drawing nutrients and water from their hosts. On the Ōkareka Mistletoe Walk you will see many green mistletoe or pirita, growing on five-finger trees. This is its common local host, but it is also found growing on the exotic tree lucerne in the Ōkareka area. 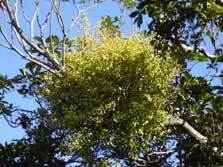 Green mistletoe is one of nine mistletoe species native to New Zealand. Another species of green mistletoe is also found in small numbers in this area, growing on Mahoe and various exotic trees. Populations of these mistletoes are scattered and localised. In the Bay of Plenty they are found mainly around certain Rotorua lakes, particularly in regenerating forest or shrubland where light levels are higher.